Thanks, SCHOOL LIBRARY JOURNAL, for the kind review! 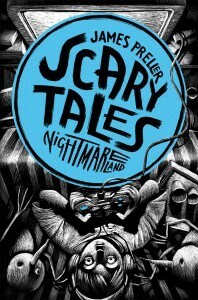 I was glad to hear from my editor at Macmillan, who passed along a quick review blurb of Scary Tales: Nightmareland from School Library Journal. I was concerned that because this is part of a series, only the first book would get any kind of critical attention. You know, read one, read them all. Each story is different and independent. New setting, new characters, new twists and turns. So I am very grateful to the editors at School Library Journal for taking another look at the series. Thanks, folks. Did you read that Jack Black is playing R.L. Stine — the real guy — in the upcoming “Goosebumps” movie? That’s just too fabulous for words. Last year in Austin I got to hang out with Bob Stine in his hotel room. We hung out on the deck, shooting the breeze, then headed over the to Texas Cemetery for a late-night reading in the dark, surrounded by tombstones. It was a pretty perfect night for me, a memory to keep, and I’m glad to see R.L. Stine mentioned in this review, which is from the August edition of SLJ. PRELLER, James. Nightmareland. illus. by Iacopo Bruno. 112p. (Scary Tales). Feiwel & Friends. 2014. Tr $5.99. ISBN 9781250018939. 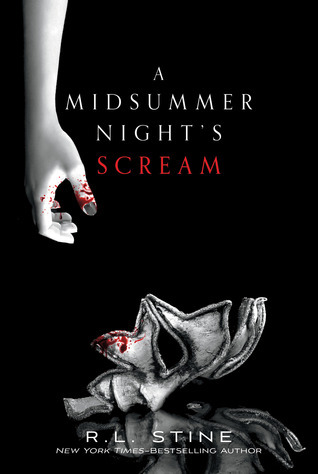 Gr 3-6–The latest spine tingler in Preller’s spooky chapter book series is sure to inspire a few chills. In this tale, a boy receives a new video game called Nightmareland. It warns users to “Enter at Your Own Risk,” a challenge that Aaron likes. He soons finds himself entangled in a world that seems like so much more than a mere game. Some genuinely creepy moments make this ideal for readers who can’t get enough “Goosebumps” and Alvin Schwarz tales. For a minute there, I wasn’t sure. I was not exactly confident that we would make it out alive. 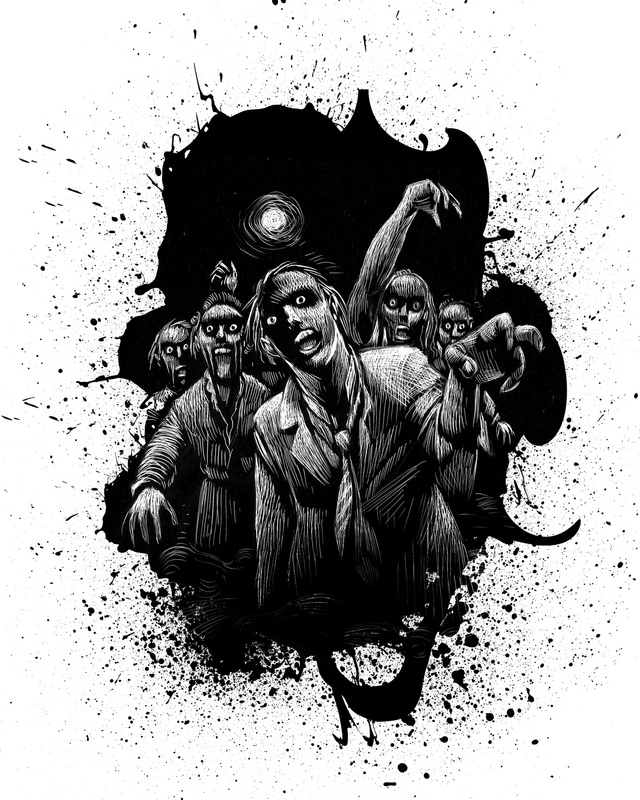 The hordes kept shuffling toward us out of the darkness, closer and closer they crept . . .
Art by Iacopo Bruno, from Good Night Zombie (Scary Tales #3), by James Preller. 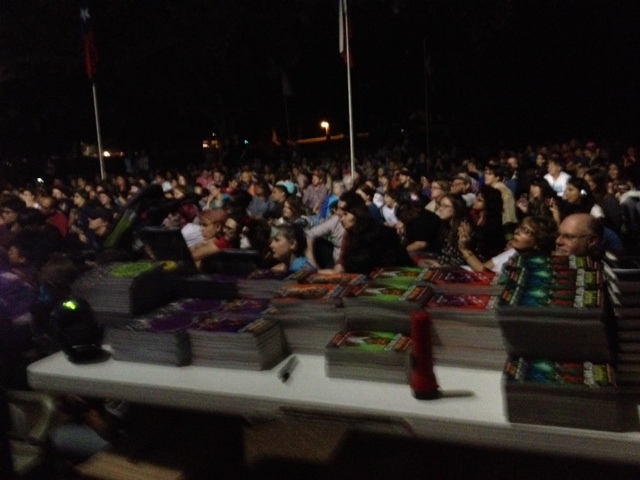 I was in Austin, Texas, on a Saturday night, scheduled for a reading in the Texas State Cemetery with R.L. Stine. A creepy literature crawl in a graveyard. What mad genius, I wondered, devises such things? I met Bob in his 15th-floor hotel room — yes, he lets me call him “Bob,” a name that no one under the age of seven actually bears anymore, they’re all named “Brendan” and “Colby” and “Luke.” We sat and chatted for half an hour or so, the old days at Scholastic, our experiences with school visits, this and that and whatnot. Time passed amiably. At seven, we crept to the cemetery, where we quickly learned that Austin was more than good beer, righteous food, and great live music. It’s a town that loves books. Forty-five minutes ahead of schedule, hundreds of R.L. Stine fans had already gathered amidst a sea of tombstones. It was an incredible vision. Many sat under the high flood lights, but others sat on the edges, and waited patiently in the graveyard’s deeper, darker, gloomier pastures. My task was to serve as the opening act, like a lone slice of cucumber on a plate. Bon appetit! Bob was the hearty main course and the reason they came, so ravenous. By 8:00, it was time to get the show started. I spoke, elicited a laugh or two, told them that the scariest thing I ever encountered was kids who didn’t like books (because they grew up and voted, and sometimes even got elected to Congress). I read the “Bloody Mary” section from Home Sweet Horror, the creepiest part of the first book in my SCARY TALES series. I had the sense to keep it brief, with no intention of messing with Texas. Next I had the pleasure, the honor, to introduce the beloved author, R.L. Stine. Beloved? Revered? Idolized? Worshipped? Words fail me. What I witnessed was that deep connection between reader and book. I saw what it was all about. The power of the word. The crowd, I mean to say, went a little bananas. They love him, you see. On a deep and profound level, the books of R.L. Stine had impacted these people — and they were there to see the man, to shake his hand, to thank him, to tell him what those stories meant to their lives. The first books they ever really, really loved. Goosebumps. Fear Street. The most trusted name in book-learnin’: R.L. Stine. After the reading, it was time for us to sign. 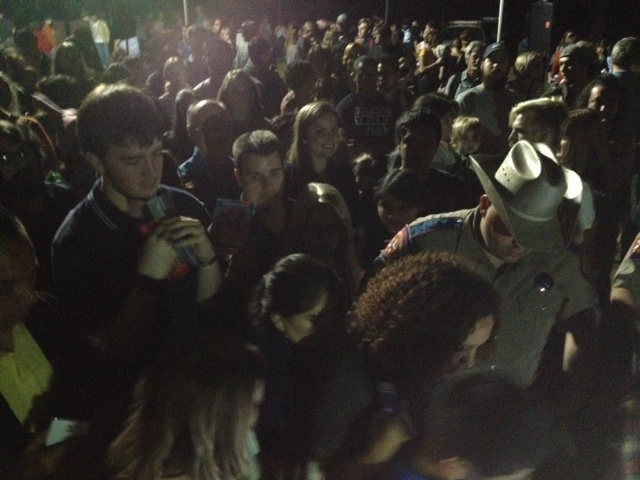 They don’t really do lines in Texas, unless, I guess, it’s for dancing. Somebody should have brought a fiddle. Fortunately a couple of good-natured cops came by restore order (at the end, after thank you’s, they even asked us both to sign a few books for ’em, which we gratefully did). Of course, R.L. was the star attraction. 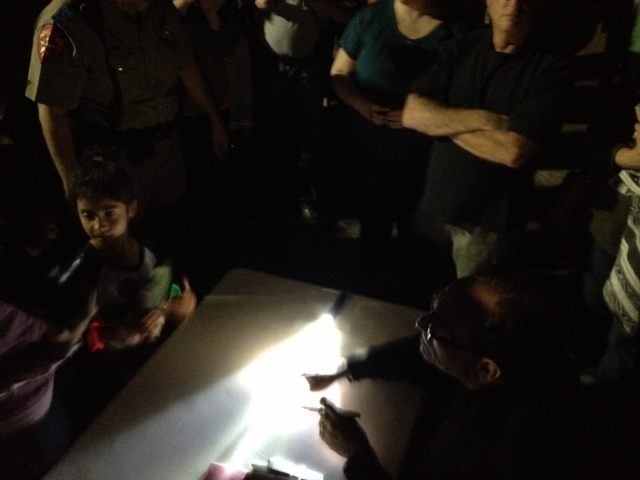 I mostly sat nearby, making sure Bob had water, a Sharpie, a small flashlight to see, and, sure, I even signed a few books of my own, basking in that borrowed light. I took a few lousy snapshots, which you see here. The entire night was a revelation and a confirmation. The power of story. The impact of books. And how lucky I was to do this job, to be in this place, to share in these moments. Near 10:00, the last of the line had finally wound down. Time to go. We headed to the car through the big iron gate, which swung shut behind us with a clang. Bob smiled. “It was a good night,” he said. And I thanked R.L. Stine — Bob, my friend — for the gift of letting me share a small part of it. And to see again what it can mean to write a book, and for that book to be read, and for it to be loved by someone, by anyone, somewhere, anywhere. It’s a beautiful thing. Even in a graveyard. Even at night. Especially with R.L. Stine.